Katherine and Lynn met and nurtured their love story in Chicago and even though they were getting married in Katherine's hometown of Winston-Salem, NC, they chose the town they love for their engagement session. I flew up for a full day session with them and we shot in so many locations that were their favorite haunts. It was, as I so often love to say, an epic date with your own personal stalker. We went to Katherine beautiful little apartment that sat directly across from the Lincoln Park Conservatory. We also hit up the Lincoln Park Zoo, Millennium Park, the waterfront, and their favorite little restaurants. It was amazing. Now I had recently broken my foot and was in a walking cast but I trucked on. For this image, there were approximately 9 and 1/2 billion people under the Cloud Gate sculpture. But I knew what I wanted so I put on my best souther accent and I hobbled a little more than I needed and asked each group for 10 minutes and help keeping the sculpture clear for Katherine and Lynn. The people were so incredibly kind and a great audience. We had all the time we needed and a nice round of applause afterwards. It. Was. Epic. Location: Cloud Gate, Millennium Park, Chicago, IL 60601. 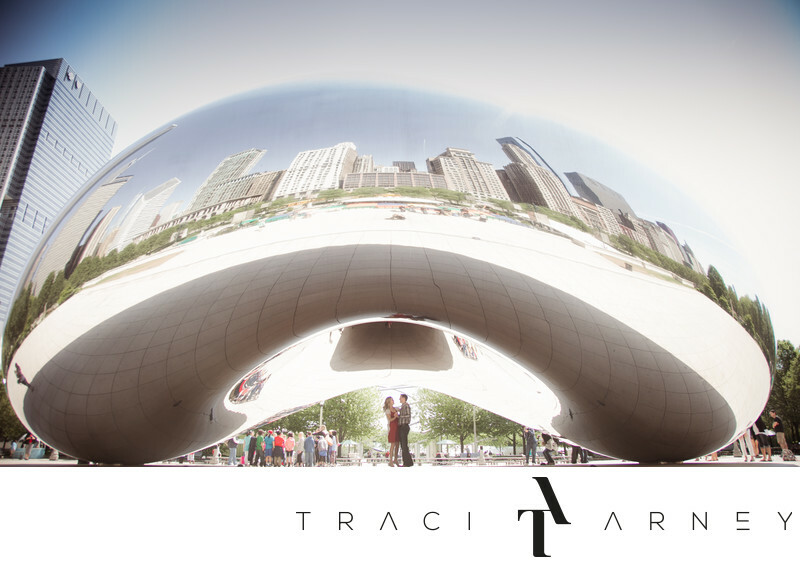 Keywords: Anish Kapoor (3), Chicago (6), Cloud Gate (6), Destination (6), Engagement Session (138), IL (3), Katherine (3), Lynn (3), Millennium Park (6). 1/250; f/4.0; ISO 200; 24.0 mm.